Have I mentioned that I'm having trouble getting out of bed lately? Not only am I not sleeping well, but I'm just large enough for gravity to keep me in bed long after I'm awake. It requires a ridiculous amount of energy to peel the still-pregnant me out of the bed and into a vertical position. So when I hear the boys stirring next door in their room, I tend to wait until somebody is hollering at me to get up- and buck up- and be the mom. But this morning the hollering was taking a suspiciously long time to begin, and since I've learned to worry when it's quiet for too long, I fought the good fight, got myself upright, and went to check on them. Sir O had taken it upon himself to bring the Captain breakfast in bed. Cookies, lots of cookies, that my little sister just baked last night. They were both so pleased with themselves that I couldn't quite get upset. And it is sort of my fault for not bouncing out of bed at the first sound of awake children, right? Looks like I'll have an extra load of laundry today. It's good to know these boys are minded to look after each other, even if they do it in ways I am never prepared for. 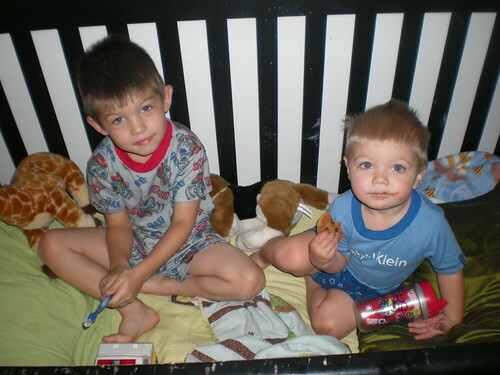 I think they'll be good big brothers, and that's more important right now than healthy breakfasts or clean sheets. Love it! Two cute little cookie monsters. Sarah also loves to climb into Abby's crib with her. I think it is adorable, messes and all. wow, I'm impressed with 2 things. 1. Where are the crumbs? My kids are like cookie monster when they eat. They'd be jumping up and down in the crumbs. 2. At least Sir O had the right thought to bring a toothbrush along! I bet Renn is glad to see that. I would be so proud of them too! What resourceful little guys, and they love each other! Cute cute! love that Sir O! Your boys are cute and we miss them! At least he has his toothbrush in hand for good hygiene!